In the present study, three strains (ChDC F213T, ChDC F251, and ChDC F267) were classified as novel species of genus Fusobacterium based on average nucleotide identity (ANI) and genome-to-genome distance (GGD) analysis and chemotaxonomic characterization. 16S rDNA sequences of strains ChDC F213T, ChDC F251, and ChDC F267 were highly similar to that of F. periodonticum ATCC 33693T (99.6, 99.4, and 99.4%, respectively). ANI and GGD values of the three isolates with F. periodonticum ATCC 33693T ranged from 92.5 to 92.6% and 47.7 to 48.2%, respectively. 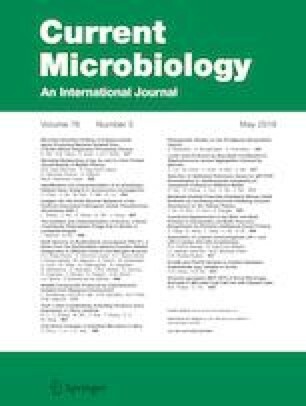 Considering that threshold of ANI and GGD values for bacterial species discrimination are 95–96% and 70%, respectively, these results indicate that the three isolates represent a novel Fusobacterium species. DNA G + C contents of the three isolates were 28.0 mol% each. Cellular fatty acid analysis of these strains revealed that C14:0, C16:0, and C16:1 ω6c/C16:1 ω7c were major fatty acids. Therefore, these three strains are novel species belonging to genus Fusobacterium. Strain ChDC F213T (= KCOM 1259T = KCTC 5677T = JCM 33009T) is the type strain of a novel species of genus Fusobacterium, for which a name of Fusobacterium pseudoperiodonticum sp. nov. is proposed. Soon-Nang Park and Yun Kyong Lim contributed equally to this work. The online version of this article ( https://doi.org/10.1007/s00284-019-01675-y) contains supplementary material, which is available to authorized users. This research was supported by the Bio & Medical Technology Development Program of the National Research Foundation (NRF) funded by the Ministry of Science and ICT (No. 2017M3A9B8065844) and in part by the Basic Science Research Program through the National Research Foundation of Korea (NRF) funded by the Ministry of Science and ICT (2017R1A2B4004894).